14" Base Casting Beefed Up? GPS: RS232 to USB Possible? RS-232 Cable - GPS same as Classic? External Antenna for GPS Scopes in a Dome? Does GPS Internal Battery Holds Ephemeris Data? Going to 2" Diagonal Worth It Visually Or Not? Meade Dew Shield on GPS Models? GPS Mirror Lock Like Classic? How to Calibrate Motor on GPS? <http://www.meade.com/support/auto.html> Note: this is also the link for future updates. 3.0i seems to correct the major problems with 3.0d (Polar Park being the worst) while retaining its many improvements over the pre-3.0 series. They also posted v33Ef for the 497 Autostars, too. Subject:14" Base Casting Beefed Up? I have just had a long phone conversation with Pete Peterson about the 14" GPS scope. He is a fine gentleman and I trust his judgment. He tells me that the base casting for the 14" scope has indeed been beefed up from that used in the smaller scopes. Additionally there are some differences in the drive mechanism that he considers a definite improvement over the smaller versions of the GPS scope. Both he and Dr. Sherrod have the 14" scope and are very enthusiastic about it. It has apparently had very few breakdowns and a better record of repair when necessary than the smaller scopes. His statement is that the 14" GPS is improved enough over the smaller LX scopes both GPS and classic that it should really be called an LX300 because of the design changes. 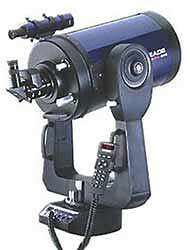 It is, he says, the best scope that Meade has ever made in the LX line. I hope this information reflects reality about the 14" GPS scope. I trust it does. His is back to Meade at this time for a repair of the electronics. I would conclude, from this conversation, that the 14" GPS scope is the one to get if the size and price are suitable. about 1 hour to degrease and install. The instructions were excellent. I, too, just installed this kit on a new LX200 14" myself.. I was a bit skeptical about its utility, but since it was only $29.95, I figured "what the heck". All I can say after installing it is "wow!". Although I didn't particularly think that the amount of torque to get the original clutch engaged was excessive, the amount with the new one is very small. I'm impressed. I highly recommend it! The EZ clutch is not only cheap and easy to install, it's pretty much a must-have for the 14". Pete went into great detail somewhere about it, but the short version is the dec clutch screw will end up stripping out, especially on the heavy 14", and there's no easy way to fix it when this happens like there is on the smaller scopes. I was pleased with mine. It does exactly what it claims: cuts the amount of torque required to hold the dec adjustment just about in half. VERY cheap insurance against what would be a lousy, inconvenient, and possibly very expensive failure. Actually I'm flattered by Bob Darlington's being so impressed with the clutch upgrade that he went to the trouble of photographing it and posting it. There is a fine line here regarding intellectual property as this upgrade solution isn't obvious. Where others focused on getting a bigger clutch knob I'd always been concerned regarding the minimal thread tapped in the scope's aluminum trunnion. Development of the EZ Clutch took about 2 months of effort, and since the instructions are revised whenever someone has to ask us a question, the instructions have been revised about 20 times. Just about all of our upgrade instructions incorporate extra non-upgrade associated tune-ups and adjustments in the area being worked on. And many times the optimal techniques that we have developed for the upgrade installation are not intuitive. This is why the installation instructions are considered to be a major part of the kit's value added, and why I've asked folks not to publish the instructions. In Bob's case, all he has is a series of un-annotated photos, and he hasn't documented any special procedures. So I'm not going to sweat it. Recently someone else got real excited about another of our upgrade kits and posted a series of extremely detailed annotated step by step photos that did disseminate our intellectual property. He flattered us by putting a huge amount of effort into his posting, and was shocked when I asked him to pull the posting. We do have sample instructions posted for our most complex upgrade - the Buck's 14" Gears. < http://www.petersonengineering.com/SkyDiv/14-inch_sample.htm> But because of the intellectual property situation we never transmit full instructions in digital form. Upgrades for Meade's LX200GPS telescope is probably the smallest niche market in the world. I make my living from the engineering side of the business designing & fabricating robotic machinery. The Sky Division is an offshoot of my personal need for things that weren't commercially available and were needed on my personal scope. I originally figured that since we had some pretty sophisticated CNC mills, lathes and machine centers available, and since I'd gone to the trouble of designing & making an EyeOpener for myself, I might as well make it available to fellow amateurs. Doc G was one of my mentors on development of the original EyeOpener. I do thank you folks for being sensitive to the intellectual property thing. And for the kind words regarding our upgrade. Arkansas Sky Observatory will certify the entire scope for a fairly hefty fee. Even so, some members of the LX200 GPS Yahoo group have their scopes shipped directly there when they order them. Check it out here: <http://www.arksky.org/> ...and click on "Services". > every night. I am thinking that this would be an easy, foolproof way to do it. Terry, unlike the LX200 Classic, the LX200GPS doesn't keep time when it's turned off. So if you can't get a GPS fix, you will have to set the time manually each time you turn it on. That is what we have to do with our club 16" GPS scope, which is inside a dome and can't get a GPS fix. On the other hand, accurate time is not important to either accurate pointing or tracking. Anything within a few minutes of the correct time is fine. > from LAST night's time inaccuracy. Is this not correct? > of up to 15 arc minutes in pointing. Accurate pointing is not primarily a function of the correct time, date, or location. These factors are needed to calculate where your local horizon is, and how much atmospheric refraction to correct for. Accurate pointing (or GoTo-ing) is mainly a function of how good your 1- or 2-star alignment is. You can easily confirm this with a simple experiment. Deliberately set your time off by 30 minutes. This is not enough to really affect your horizon calculation except for very low objects. Then do your star alignment as usual. You'll find your scope GOTO's just fine. If the time were that important, you'd miss by a mile. The only problem with having the time, date, or location off is that some objects may be reported as being below the horizon when they are not, and the correction for atmospheric refraction will be off. But if you are "close" on location and time (and date of course), your pointing accuracy will be very good as long as you have done a quality star alignment. And the key to that is to use a reticule eyepiece. Oh, and very inaccurate dates or times will cause the internal calculations of the positions of the planets, and especially the moon, to be incorrect. If you want to open loop acquire and track satellites, you need fresh satellite ephemerides, good location information and precise time. Low earth orbiting satellites can move at a few degrees/second. > the alignment stars are nowhere near being in my finderscope field of view. > I'm 5-10 degrees off. Smart Mount is turned off. Why is this happening? First, do a Calibrate Sensors. That tells the Autostar your local magnetic deviation from true north. Then, with recent firmwares, do *three* AutoAligns (this can take 3 nights, or be squeezed into one 15 minute session). The Autostar will learn, from your centering of alignment stars, how to tweak the level sensor and magnetic readings and the initial slews will improve. My own drops from a 5 degree error down to less than 1/4 degree, i.e. within the FOV of the 26mm eyepiece. (b) use Two Star alignment instead of Auto. When doing so, first -accurately- point the OTA due true north, and level the tripod head and OTA before powering up. You can achieve initial slews that will only be limited by the accuracy of your north-pointing. (I use a landmark a few blocks away, and can achieve sub-1/4 degree slews). The accessory screws on the OTA are 8-32, just like the LX200 Classic. The tripod & wedge mounting bolts and spacing is also the same as the Classic. I got a new LX200 GPS 12" and have run into a little problem. When I was removing the long centre 1/2' dia. screw, it seemed that it was tight a couple of turns before it released. No problem noted after that. I have not used it since. I decided today to remove the bottom plate and see if I could see any problems. It turned out the inner nut with the two holes in it was loose. It had rotated and since there was wiring that also fed through the nut to the other parts of the scope, it unplugged the connectors from the main circuit board on the front panel. I do not know where each connector goes. The nut has been fixed. There are one 9 pin, two 6 pin and one 2 pin. The nine pin was easy since there was an open 9 pin connector for it. I do not know where the two 6 pin go and there are 2 available plugs. The 2 pin has 2 possible plugs to fit into. -The nine pin is obvious. -The six pin with ferrite bead on the wire bundle goes to the mating connector nearest the power plug. -Only one place left for the other 6 pin. Editor's note: see photos above. > > I'm considering selling my 10" Classic LX200 and getting the 10" GPS version. > > What are peoples thoughts on this? > I won't comment on the GPS part of this equation. > can live without for mostly visual use. The biggest question is how good one's existing optics are. If you are happy with them, it is the 'long term' support, 12v operation, and the UHTC coatings, that probably represent the biggest advantages to the GPS. > mechanical aspects of the GPS vs. Classic LX200s? The fork and drive base, to me, appear just as good. As far as steadiness, I don't note any improvement, however--excellent on the 8, good on the 10, just OK on the 12 and ? on the 14. The dec seems considerably smoother than most classics (those without ball-bearings in the dec). The gearing, the transfer gearing, in RA is worse according to what I'm told (I haven't torn one down yet). Small nylon gears in a position where high torque is possible. I am told by Clay Sherrod that Meade is taking steps to improve this situation now, however. Don't like the dec lock at all--it's a considerable step _back_ from that on the classic, appearing similar to that on the LX90. Works fine on an 8, but has problems locking firmly with the larger scopes; that's why various entrepreneurs are selling "dec-fix" kits already. If you have an LX200 that's working well, I'd hold off. Meade is still fixing problems with the GPS. There was a brand-new out of the box LX200 GPS 12 on the field at the recent Peach State StarGaze. The new owner could not get it to align. Period. Operator error? Maybe. Software? Maybe. Hardware? Maybe. Enjoy your "classic" 200 for a while longer...maybe 6 months or so...then come back. I would not upgrade even then unless you want to go to a larger (or smaller) aperture. The GPS is nice, but it just doesn't offer enough advantages over the classic to be worth the trouble, in my opinion. The good folks over on the Yahoo LX200GPS group have created a Checklist for first time set-up and quality check, and then steps for regular set-up. Goto: <http://groups.yahoo.com/group/lx200gps/>. Go to the "Files" section (Note: you must first join the group before you can access the Files), and look for "LX200GPS Start-Up Checklist.pdf." There are several other very useful files for the new GPS owner too, including tips, etc. The scope is, as others have stated, about inbetween hard stops, but it starts one way, goes about 150 degrees, then stops, but instead of changing direction, it continues the same way. This puts it almost at its hard stop when it believes it is in home position. SO when it goes to Arcturus, it hits the hard stop. So if anyone has any suggestions, please shoot. Right now I am thinking it may be a dirty sensor? > the respective split rings that control the 600Œ or so of rotation. > fired her up, and got a good alignment. Problem fixed. In any case, a first troubleshooting step is to turn off the Home Sensors: Select Item > Setup > Telescope > Home Sensors > Use Sensors > Off. With them off, the telescope will not attempt to find Home (useless in Polar anyway). With the telescope off, on a wedge, with Dec set at zero, and *the eyepiece end* centered over the power panel with *the eyepiece end* pointed north (corrector pointed south), release the RA lock and rotate it west (counterclockwise) until it hits the hard stop. Now rotate it east until *the eyepiece end is* just pointed north again and centered over the power panel (corrector pointed south), and lock the RA. Power up and align normally, and the scope should never hit a hard stop. Also, be sure your friend is actually in Polar mode. Finding the Home sensors is not normally part of a routine polar alignment (One Star, Two Star, or Easy) unless he chooses Align on Home. That last choice is really there for a "lost" remote telescope that got powered down (for whatever reason) in some position other than Park. Try the LX200GPS group. Read the Archives, Files and Databases, you'll find a wealth of info already in there. I look forward to the almost 50 emails a day I get on that group. I've already downloaded the new AS II v. 3.33 and build 1.1a firmware. There are still a lot of issues. After resetting and "taking out the trash" (one of the options on the v3.33) and THEN loading 1.1a to my handbox, did I get it to do any GOTO. Using my 26mm Meade "standard issue" eyepiece, I was able to find the two bright alignment stars (Sirius and Alioth) in this eyepiece through the hazy sky, and did a GOTO to Jupiter and it was in the eyepiece. What a rush that was!! I've since Calibrated Sensors and Trained Drives, and now it doesn't even come close!! I can only believe that the light overcast resulted in my seeing only the brightest stars, which allowed me to pick the correct ones for the initial alignment. I'm not too concerned about this scope, I think the mechanical and electronic problems will get ironed out. Meade has been pretty responsive so far. My biggest concern is the way Meade seems to label each tube differently, I'm not sure what they are doing with the optics and then they come out with a new coating material for the mirror just a week after I received mine! It was my own fault for jumping in right on the new release, I guess. I received mine on March 12, and it doesn't even say it has EMC coatings on the tube or on the box. It's hard to know when this thing was really put together. The manual alignment is the same as the previous version of the LX200 except that the control panel of the GPS version must face south vice north, i.e., be on the south side of the tripod. I recently purchased a new 10" LX200GPS and have seen numerous postings about 18V and 12V-18V convertors and was confused, so I called Meade tech support and they told me that, although older LX200's ran on 18V, I should _NOT_ run my new LX200GPS on anything other than 12V. Dead right. This was one of the redesigns on the new scope, to get away from exactly the problem being discussed. Use of 18v, applies _only_ to the LX200 'classic'. Maybe I can help you with your power concerns and the 8" LX200GPS. On another users group dedicated to the GPS version of scope, virtually no one uses the internal batteries. The scope responds best to a voltage of 13.6 to 15 when slewing and working with a load. The 8 C cell batteries at most will only put out 12 volts, add cold weather, and it will be less. Don't get me wrong , the internal batteries will work, but the amount of time they will work makes them a very expensive way to operate the scope- in the field. Most owners, including myself, use a 12v. 26 Amp Hr. Jumpstart Battery. They typically put out 13.5 volts fully charged and will run the LX200GPS 8" several nights before charging is needed. I use this battery even though A/C power is available. I don't have to worry about the power company interrupting my viewing session or surges or power spikes or electrocution. However, do not run any dew equipment from the same battery source. Editors note: for additional battery power ideas see this topic. I have two Jumpstart batteries, one for the scope and one for the accessories. Also do not try and use rechargeable C cell batteries, their power curve is horrible for use in this scope especially in cold temps. Many have reported using these Jumpstart batteries for over three years on various scopes, and they still take a charge fine. We use the battery compartments to hold counter weights to balance the scope in polar mounted (wedge) situations. Remember, if you feed your scope the proper diet ( 13.6v to 15v. ) to keep it happy. After I sent the message about using the JMI hand paddle with my LX200GPS, I did some more testing and, to my dismay, found that I could not control the focus speed while using the Meade paddle. The Meade microfocuser speed selection had worked perfectly just before I updated the firmware from version 1.2A to 1.6B but now, no matter what focus speed I attempted to select, it always was "FAST," i.e., the speed which I reported took 11 seconds to move from either limit to the middle of the focus range. I phoned Meade and the technician had not heard of any problems with the new version but suggested that, instead of using the numeric keys, as I had been doing, I try using the scroll up and scroll down keys. IT WORKED LIKE A CHARM! the moral, if any, is that when Meade comes out with a firmware update, they make changes and it may be many months before there is any documentation for the user. > not forcing the focus knob at all - it turns very easily even when fully locked. For those that can turn there mirror lock stop to stop, it is made the way I thought it was and is easy to adjust. 3. after you have it out you will be able to see the 8" steel gear... that will have about 1" of it with no teeth this the stops. 4. you will have to take your finger and push down on the gear until the part with no teeth on the gear is pass the hole towards focus knob..
you will be home Sweet ..
BTW Meade Sent the Allen wrenches for this job make sure they are pushed all the way in the alum cap screws as not to strip or mar them. He also posted a zip file there with pictures of the insides of the scope, but it may be just the drives- don't know if it includes the lock. Subject: GPS Microfocuser Step Size? > Does anyone know what the step size is for the Meade microfocuser? The microfocuser on the LX200GPS is not a stepper motor. The Meade microfocuser uses a typical inexpensive DC "analog" motor. Such motors don't have a clearly defined "step size" (they can stop anywhere, they call fall backwards a bit, etc.). They do, however, tend to stop with an armature pole aligned more or less (there's the "lack of STEP" again) centered with relation to one of the field magnet poles. The Meade driving circuit for the focuser is pulse width modulated (PWM) at nearly 12v (probably within a volt of full battery voltage). They're not trying for "stepping", merely "delivered energy over time" (the area under the PWM's steps per second). To answer my own question: has anyone come up with a quick and/or reliable method for setting the Microfocuser to the center of its range? The answer: you simply run the Microfocuser in and out until you have the "knobbed set screw" just even with the edge of the slot in the outer barrel of the device. This gives you approximately a quarter of an inch (6mm) available travel either in or out from that point. > downgrade from the classic coatings. The point, is not that the standard coatings have been downgraded. The new coatings do what is claimed, relative to the older Meade coatings. What has become plain though, is that compared to the Celestron coatings, the difference is not so large. It appears that the Celestron 'Starbright' coatings, have been significantly better than the older Meade offerings for some time, but this was not being pushed in the same aggressive way. Meade have now overtaken Celestron, by a small amount (the new Meade coatings appear to give a flatter response curve than the Celestron offering, with better response at the red end of the spectrum, but very fractionally less response in the green). > > that's obviously not what EMC was. > > baseline, not the EMC. I don't argue with that. > > it's clear that Meade's advertisement doesn't compare UHTC with EMC. > How is this 'clear'?. Well, it's 'clear' because the baseline graph is labeled 'standard', not EMC, and because the specifications list 'standard' as MgF, which is not multi-coated. Big improvements in thoughput are obtained by changing the mirror coatings; The 'standard' Al+SiO mirror coat is only 92% reflective at visible wavelengths, and can be improved to >98%. My guess is that here is the principal difference between EMC coatings and UHTC. This will explain the difference in thoughput between EMC and UHTC; but also mean that the 'standard' coatings have been downgraded - Not so much from the throughput point of view, but from the contrast/multiple reflection point of view. Anybody made a comparison between non-UHTC new scopes and 'classicals'? That would be the missing test to prove/disprove my theory. In a nutshell, UHTC performs as Meade claims vs. EMC coatings. From: Susan-- Does the LX200GPS scope interface cable at the computer have to be RS232 to the Com port or is it possible to interface using USB? I suppose one gets an RS232 to USB converter if it exists? Meade makes a USB-RS232 interface now..... just saw it at OPT's website while shopping for something else. Works for "Classic LX200s, too! Autostar interfaces perfectly via USB using the Belkin USB to Serial adapter F5U109, $29.99 at Circuit City. It's marketed as a PDA adapter, but will work with any serial device. Never misses a beat. I also use the Belkin 4-port USB Mini-Hub with the laptop, a tiny little thing half the size of a deck of cards. Uninterruptible Power Supply to desktop (for automatic shutdown in case of power failure). Subject: RS-232 Cable - GPS same as Classic? Does someone know if the RS-232 cable for the GPS and the Classic LX200 are exactly the same? The Meade 9-pin RS-232 to LX200 cable that I bought for my Classic works fine with my GPS scope. time in the scope each time we turn it on. A minor inconvenience, to be sure. <http://www.gpsoutfitters.com/> and check out the Vortech Antenna System. I think it is around $100 but might be worth it for some. One person reported he had one and it worked very well. > booster? At what cost, though? You have to use special coax that has low losses at 2G; Most of the cost of remote gps antennas comes from the cable. Even with good cable, if you have to reach more than 1-2 meters, you will have to use an active antenna. I would have thought with such sophistication that is built into the GPS scopes that there would have been a small clock panel incorporated somewhere that enabled you select local time, hour angle, GMT, UT etc. There is certainly plenty of room on the forks. >if you're getting a GPS fix every time with the new scopes, though. Subject: Does GPS Internal Battery Holds Ephemeris Data? > The battery, allows the GPS, to hold it's ephemeris data, not just the location. I have seen that to be true, I've run multiple tests of unplugging my LX200GPS' battery to force the GPS receiver to its dead-cold state (random time/date, Tokyo's Lat/Long). I have a 12" GPS system which has worked perfectly until last week when the dew heater control (BC&F) pulled from its fork arm velcro and landed on the wedge (permanent metal pier into ground) and I guess there was an earth from the tape connector part as a nice tiny blue spark popped and the dew heater failed. At the time both the LX and the dew controller were running off the same 12V battery supply. From that point the LX complained that the RA motor had stalled whenever an "East" motion was required and although N,S and W work from the key pad I have no joy with E (rightmost key) it just moaned that the motor had stalled. I replaced the fuse on the dew controller (2Amp) and gave it its own battery (it works fine) and recharged the one for the LX - (in case it was the poorly charged battery trick). To no avail. Now I can turn on the scope go through the polar one star align and the motors slew to Polaris (so good so far) but after I adjust the mount and press enter - I get the message "motor stalled" this is most frustrating as I have W but no East. I can only assume that this is 99.9 % going to be an electrical problem given the fuse blowing coincidental timing. I don't have a problem having a poke in the guts of it but I have no idea where to start - does anybody have any ideas? We can rule quite a few things out. Power is getting to the motor controller (since otherwise it would not move W). The message, is saying that when it signals the motor to move E, no pulses are being seen from the movement detector. Fortunately, we can rule out a failure in this detector, since it is the same system that detects motion in the opposite direction (all that changes is the 'timing' of the two signals). Similarly, problems with the motor or gearbox, can largely be ruled out, since these work in the other direction. There would seem to be two likely possible failures. The first is the motor driver chip itself. The second, is the op-amp circuitry feeding this chip (more fragile). Though both these parts are partially 'common', to the other direction, they are being driven the other 'way', and different internal transistors are being used. The components are a L2724 driver, and parts of two LM324 quad op-amps. These are U15, U16, and U17. Fortunately, none of these parts is expensive, and are readily available in the UK (in fact the L2724, is easier to get over here, than in the States - I have a quantity, that I will sell to anyone who needs one. It really is down to how good you are at electronics/soldering. The key with a repair of this sort, is to remember that the board is a lot more valuable than the parts. It is not worth spending a lot of time trying to desolder the old parts, and risking damaging the board. Instead cut the old parts out (for the cost of a few pence for the op-amps, and a couple of pounds for the driver), remove the legs individually, and solder in the new parts. It would be relatively easy with a scope, to identify which part has actually failed. Fortunately the fact it works the other way, rules out a failure further 'inboard', to the main control logic. If you are not into soldering yourself, this board is not the place to experiment. Instead see if there is a local TV repair shop, who will replace the parts for you (though see if you can have a look at the quality of their soldering first - a lot are remarkably bad...). Graham, based on the symptoms, it sounds like your motor driver has blown. These typically are a circuit usually called an H bridge with the motor as the cross bar and transistors as the four vertical arms. Going one way, current through the H will flow Northwest to Southeast, while for reverse direction, current would flow from Northeast to Southwest, reversing the direction of current through the motor. So what seems to have happened is that one of the four transistors was blown out - the motor would then move in one direction and not the other. So, you need to determine which IC is the motor driver and repair it. Note: it may be a dual motor driver with two complete H-bridges. The part probably costs less than $5. > receive in the mail any day now, but I have a concern which came to mind this morning. > appear that the GEG can mount to the scope with the microfocuser in place. No the GEG will not mount with the microfocuser in place. One of the main 'points' of the GEG, is that it fits to the 3" visual back, to maximize the open aperture. The microfocusers mounts to the same place, and does not offer 3" threads on it's tail. > to refocus after engaging the lock. > who can elaborate on this? > mount to the working end of the microfocuser? I'd be interested. This would 'throw away' a lot of the reason for the GEG. The actual 'clear' diameter of the microfocusers is less than that of the main scope, and also since you are shifting the imaging plane further away from the scope, the vignetting caused by the baffle tube will get worse. I'm afraid that if you want the large clear aperture that the GEG gives, you will need to ignore the microfocusers, and possibly consider an alternative solution to most of the mirror shift problems (such as attaching a RoboFocus to the main focussing knob, and letting it compensate in software for the 'focus' shift - though not for the meridian shift). It is not possible to mount the GEG on the new GPS focuser. The focuser takes 2" tubes while the GEG is designed to be threaded directly on the back of the scope with the 80 mm thread. It is not possible to make and adapter which would do what you want to do. Sorry. Subject: LX200GPS: Going to 2" Diagonal Worth Every Penny Visually Or Not? Got a 1.25" Tele Vue Everbrite ($190) diagonal for use with all of my 1.25" eyepieces. It was like buying a new scope compared to the views I had through the Meade 1.25" diagonal. This is the setup I use 90% of the time. I got the Meade 2" flip mirror system ($250) for astro-imaging, but it also makes a fine 2" diagonal. The new ones have UHTC coatings, making them even better. Since the mirror can be readily collimated (rare for a diagonal), you can get a nearly perfect setup. I'm writing this not to discourage you from getting a 2" diagonal, but to give you some idea of the caveats and alternatives for your hard-earned dollar. > realized "duh, use Google! > But I'd still like to know: Is SMT worthwhile? Assumint that it works as well as T-point, the answer is "maybe". Remember, it only can correct for repeatable errors. Mirror flop is still going to produce uncorrectable problems assuming that the primary is not locked into place. And with these systems there really isn't an workable way to make all of the corrections perfect. But it does improve things. If you are having problems now with getting an object on a CCD chip after a slew then it would be worthwhile. If after a slew the object is on the chip just not centered then it is probably not worthwhile. I have an LX200GPS and use T-Point to improve pointing accuracy. I want to point out that my work was done some years ago. It was in the late 1990s as I recall. It is true that a very poor scope mount is hard to improve with T-point type programs. But if the scope and mount are mechanically stable, that is, the scope always does the same thing without much hysteresis (backlash) the pointing can be substantially improved. I have the general feeling that in the past 5 years many scopes have either started life in better condition or they have be tweaked to the point where they are fairly good pointers. I the latter case, the mount can definitely be improved and will give pointing to a (very) few arc minutes. I have had many reports of one or two arc minute pointing accuracy over the whole sky. It is very important to do the T-point model with the scope loaded exactly as it will be in use. Weight and balance can have a strong effect on the model since the weaker mounts are more flexible. My general feelings about the usefulness of T-point like modeling is that these programs are definitely worth while if you have a reasonable mount in the first place. I actually started to use the Mark Simpson's OTA Alignment Method. It is great. But it is written for the LX200 Classic. I have the GPS version. The difference is that with the GPS version, you cannot turn the optical tube over on itself the way the classic allows. The GPS tube rotates from just past the vertical in the up direction to just past the vertical in the down direction ... maybe for a total angular motion of about 200 degrees at most. In other words, it rotates the direction it points from straight down the fork arms pointing to the base, to straight up the fork arms pointing towards the sky with only slight motion past the vertical. Declination error and optical-mechanical tube misalignment are closely tied together because it is hard to see which is which through the eyepiece. The best I could do was get the stars to rotate in an oval pattern within the confines of the reticle--which means I am close. Problem was figuring out whether the optical-mechanical tube misalignment was reflected in the length or width of the oval pattern of star rotation. To complicate matters, there is always a little slop in the wedge. This is seen when you adjust the machine screws. Only a little pressure is required to turn the screws and move the optical tube, but that is all it takes to make a slight motion of the wedge (I use the Super Wedge on my 8" LX200GPS). All these factors combine to make the fine adjustment complicated. What is need, ideally, is a way to make the adjustment with the scope in the Alt-Az mode. This is why your procedure works so well with the Classic LX200. Since the GPS tube cannot rotate over on itself, however, your procedure doesn't work with it. Unfortunate. Subject: Meade Dew Shield on GPS? The current Meade Hard Dew Shield does not fit the LX200GPS units. The LX200 Classics had a groove running around the casting at the corrector end of the scope; the set screws for the dew shield locked into that groove. The LX200GPS unit does not have this groove? >Can anyone direct to some information on the GPS model mirror lock mechanism? >and unlatched or is it something more like the Bisque mirror lock collar? No, the GPS mirror lock works very differently. It is a collet type mechanism that immobilizes the center mount of the primary mirror where it slides along the central baffle tube. I have a 10" GPS and its mirror lock works extremely well --- very secure but producing no stress on the mirror itself. I consider it to be the single most significant improvement of the GPS over the Classic. I don't have a picture of the mechanism. It is hidden beneath the back end plate of the OTA. The locking knob has a gear on the inside end of its shaft. It engages teeth on the outside edge of a large metal disk connected to the mechanism that locks the position of the mirror on the central baffle tube. Rotating the locking knob one direction rotates the large disk to tighten the collet on the central baffle. Reversing direction loosens it. The teeth do not extend all the way around the large disk. So sometimes the locking knob gear jams to a stop before the lock is fully engaged. Soon after the GPS scopes first started shipping Buck Harley discovered that in such cases you can remove the locking knob with its shaft and gear, then reach in and rotate the large disk with your finger. Replacing the locking knob will now allow sufficient rotation to fully engage the lock. If you happen to move the large disk in the wrong direction, then just repeat the process and move the disk in the other direction. You don't need to tighten the lock down hard. Just a little snug is enough. You should not attempt to use the coarse focus knob while the mirror is locked. Damage to the focusing mechanism could result. This design is intended to precisely hold the mirror position. So, yes, it is meant to allow effective use of a separate guide scope by eliminating mirror flop when in the locked position. Are you saying that the central baffle tube itself is moving inside the OTA as the scope slews across the sky? The mirror lock could not do anything about that, since it secures the position of the mirror mount onto the baffle tube. Of course, if the mirror lock is disengaged to allow use of the coarse focus knob, then the mirror is free to flop around as much as ever. Resetting the lock will tend to move the mirror back to roughly the same angle has it had in the previous locked state, but this position can vary somewhat with each use of the lock. For instance, if you want to test GOTO accuracy, then you need to set the lock before the first alignment star and not touch it again until after the last test star is recorded. Using the coarse focus knob while the mirror lock is engaged will result in severe image shift, and could damage the coarse focus mechanism. So changing the focus with the mirror lock engaged requires use of a secondary focuser, such as the MicroFocuser included with the GPS scopes. There is a measurable bend in the baffle tube. The 'key' problem to remember, is that any component before the secondary, has it's effect on the light path amplified by a factor of about 5*. I calculated that for an LX200/12, the tube itself would bend by about 0.3 arc seconds through 180 degrees, with the weight of the mirror, when at the normal focal point (I measured where my mirror was, for the scope focussed about 4.5" behind the rear of the focuser). This then gives an 'unavoidable' error from this source alone, of about 1.5 arc seconds. The rear plate (I was guessing on the aluminium alloy used, but assumed 6061 - similarly I was guessing on the plastic used for the baffle tube), gave a slightly lower distortion, but brought the total up to just over 2 arc seconds. There was also a _tiny_ bend in the mirror itself. In a sense, there is a 'minimum' movement, that is as far as I can see, unavoidable for this design, no matter how well everything else is locked. I'd put this at perhaps 2 to 3 arc seconds total for the worst case (180 degree) movement of the scope. Moving the coarse focuser with the lock engaged, first 'rocks' the assembly hard to one side or the other, and then tries to 'scrape' the collet along the baffle tube, putting much more force onto the focuser itself, and all the other components, than they are really designed to take. With the 'lock' done up, and moving the scope round the sky, the total movement, in the axis parallel to the line through the coarse focus knob, and the centre of the tube, was down close to the 'bending' limits. However at 90 degrees to this, there was still a significant shift. It makes sense if you think of the system as being locked at the collet, and at the focuser shaft, it can still rock at the front at 90 degrees to this line, till the end of the outer tube touches the inner tube. The clamping force of the collet, reduces this motion, but does not completely remove it... I must admit I did find myself wondering about careful placement and design of the guidescope mounts, to at least partially compensate for the motion, and wondered if this was how some systems appear to have very good responses. When dealing with 'pure bending' (as opposed to nasty shifts/rocking motion), it would be possible to site the guidescope, so that it's bending is in the same order as that of the main scope, and get a final result that is better than one scope on it's own. As has been mentioned by another poster, Al Testani, was doing a lot of work in this area, trying to measure and model the errors between guidescope and main scope across the sky. It might well be worth talking directly to him, to see how he was getting on. Subject: LX200GPS Adjust Guide Rate Feature? > Does the GPS have the 'adjust guide rate' feature? I provide free patch kits for the firmware (posted to the LX200GPS Yahoo Group's Files area), and one of their features is extending that range to 200% of sidereal. Subject: How to Calibrate Motor on LX200GPS ? I attempted to train my 10" as soon as I got it. Turns out that it worked great. And the best part is that I didn't even have to take it outside to do it. 1. Get a laser pointer. 2. Find a way to keep the laser pointer on by itself. I just wrapped a piece of tape around the trigger button. 3. Tape the laser to the OTA in some manner that the laser point projects onto a wall. 4. Tape a piece of paper, which you have drawn a target on, on the wall to act as your targeting object. 5. Complete the training process as described in the manual or on the AS II handbox screen. You don't even have to look in any eyepieces. Just guide the laser point back to the target. VOILA!!! Laser Trained Telescope! Editor's note: here's another method for training the GPS drives in polar mode. Outside link.